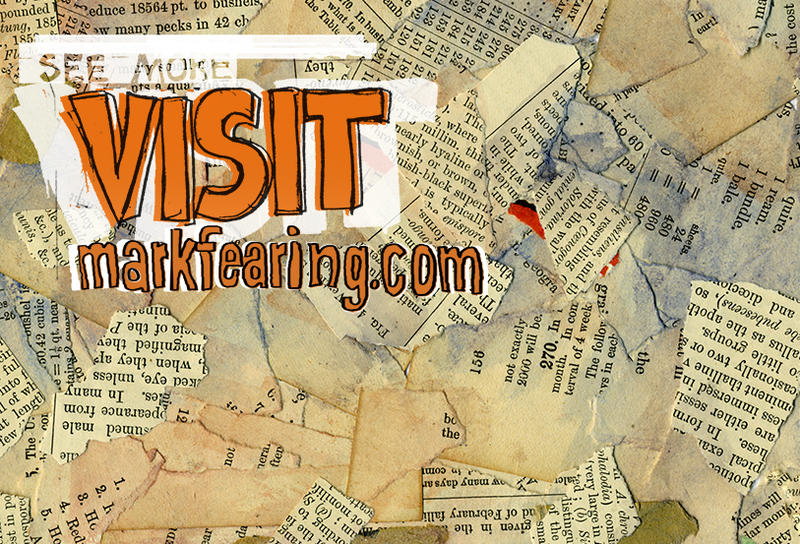 Sub It Club is so lucky to have author/illustrator Mark Fearing back in this second post. Mark explains a bit about his career history, how he got his agent and shares some more postcards. Plus there’s a VIDEO that will crack you up. How did you get your first illustration job? *Just goes to show you that handing postcards out at events and a carefully targeted mailing list may be better than sending out hundreds of cards at a time. So your list was perhaps perfect! On the back of this postcard, Red’s story continues. With her! I have worked with agents in different capacities throughout my professional life, but I wasn’t repped as a full-time author/illustrator until I signed with The Sheldon Fogelman Agency. Some of their agents contacted me at an SCBWI event in Seattle. * I think my portfolio won an award that year at the event. I spent a few weeks exchanging samples of my writing and art with them and they gave me notes on some of my manuscripts to see how well I took notes. After a few weeks they signed me. I am now repped by Sean McCarthy of the Sean McCarthy Literary Agency. He has spent years patiently reading through all my first drafts. Looking back at many of my first drafts– I don’t know how he does it. 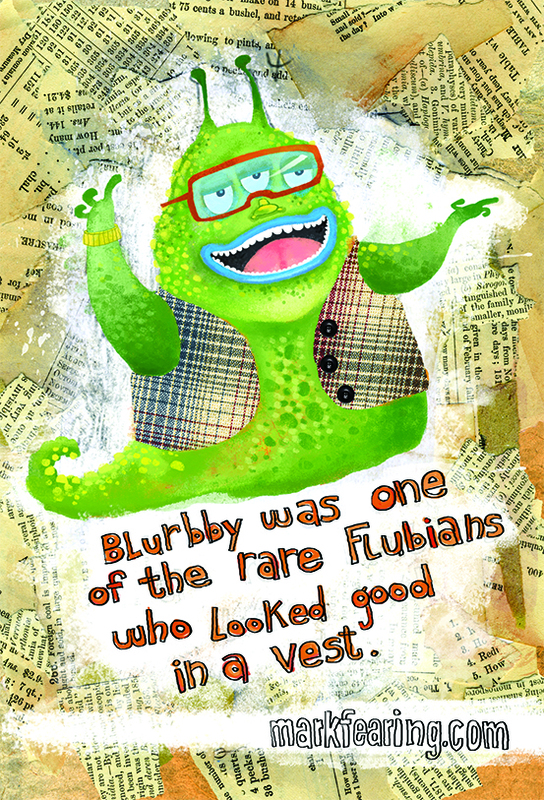 *Another good reason to join SCBWI! Another postcard from the past. LOVE the color and collage effects. Have you always worked with agents? On and off. I worked full-time in graphic design, interactive design, animation and TV production for many years so my drawing and writing has a hobby in the best sense of the word. I didn’t need to make a living from it so I didn’t have any interest in an agent and I was intimidated by the professional world of illustration. As time passed I realized that I really, really, really wanted to do this and I began to have my work reviewed by agents and art directors. Lot’s of dead-ends, lots of ‘Not Interested’ responses. A few ‘Please stop bothering us’ responses. I was told by a lead agent at one of the large agencies that represent picture book authors and illustrators that my work was ill-suited for picture books and that I should get out of the business. * That sent me away for a year or so. My current agent, Sean McCarthy, has been patient in helping me develop my work and I know I wouldn’t be where I am in the industry today without his expertise and guidance. *I’m speechless! (OK, not for long though.) This is a great example of the submission process, the rejection and disappointment that are a part of it and the perseverance that is necessary. I’m so glad about the happy ending! The back of the “Blurbby” postcard. You work on picture books primarily. How did the animated project BOOK REPORTS come about? You are right. * Picture books are my main interest and about 85% of my work. Book Reports is an animated show I wrote and developed with Dreamworks TV. I went to graduate school for animation at UCLA and at the end of my first year of grad school I made an animated short called The Thing with No Head that aired on Nickelodeon one Halloween. Before my second year of graduate school I was offered a job at Walt Disney Television Animation, so I am very familiar with the world of TV animation. 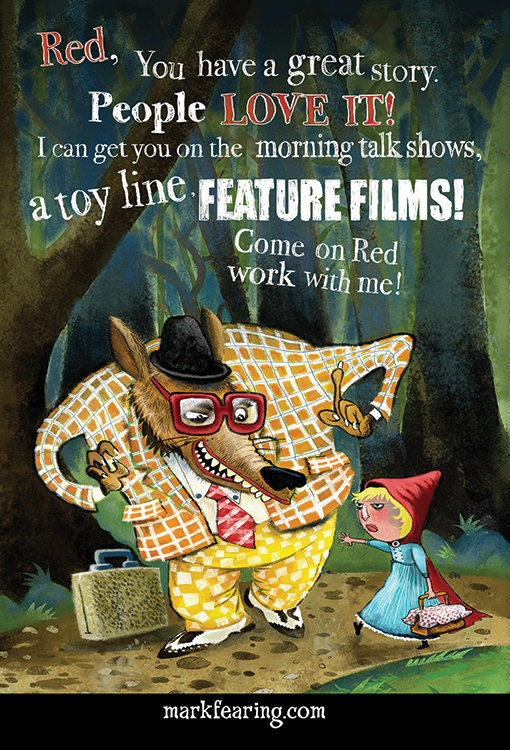 I have since done development work for Nickelodeon, even pitched a few shows, and did development art for Laika. So I know some people in that world and the executive developing online animation at Dreamworks was a fan of my work and reached out. It took about a year to figure out how I could fit a project like this into my schedule. I wrote the scripts, designed and created the characters and layouts, did the voice casting, hired a composer, edited the final soundtrack and did an animatic** of each episode. The series was animated by Oddbot Studios in LA. All in all it was great fun – but exhausting! * I never get tired of hearing that. ** “a preliminary version of a film, produced by shooting successive sections of a storyboard and adding a soundtrack. Origin: 1970s: from animat(ed ) + -ic, or a blend of animated and schematic.” Yeah, I had to look it up! Take a look at BOOK REPORTS! I have to say, I’ve had similar experiences in crit groups and in the classroom. All great fiction is truth! I want to thank Mark again for sharing his journey with so much honesty. Very inspiring! If you missed the first installment, click here. The GIVEAWAY (!) 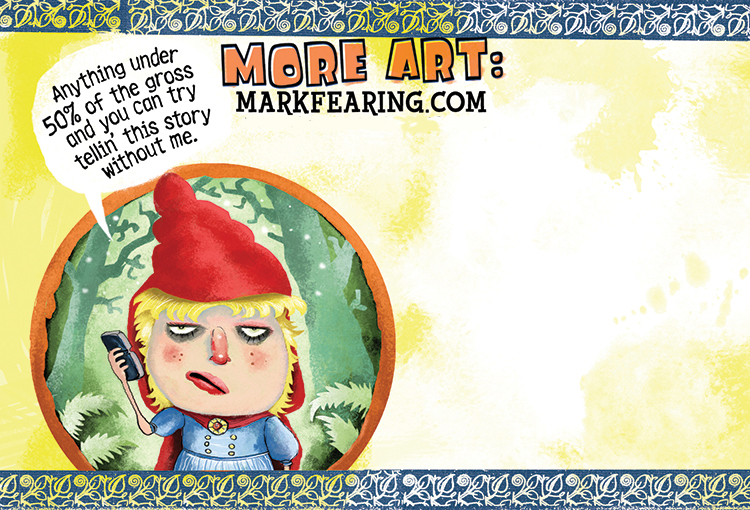 info is there: receive feedback from Mark Fearing on an illustration, a postcard design or a website portfolio. Leave a comment on that post telling us that you want to enter. We’ll announce the winner February 28th. I love, love, love the book reports! what fun. And the postcards are awesome too. Thanks for sharing Mark’s post. I agree, Sue. And you’re welcome. I enjoyed putting this together– Mark is fantastic! “Nothing’s scarier than 7th graders…” Might have to agree with that 🙂 Great job! And thanks, Dana and Mark, for sharing! Nifty! As for postcards – mine are leftovers from the stone age, time for a change. Thanks Mark and SubItClub. Please enter me in the contest. We are so blessed to have Mark participating here. Thanks especially to the SubItClubbers who remembered to have posts for the illustrators. We love you!